If, like me, you only have limited time in Mandalay, Mingun is a serious contender for a ‘must-see’ attraction. From the cow-driven taxi carts to the truly impressive main temple and even the Mingun Bell, which had the title of the ‘largest ringing bell in the world’ until 2000. 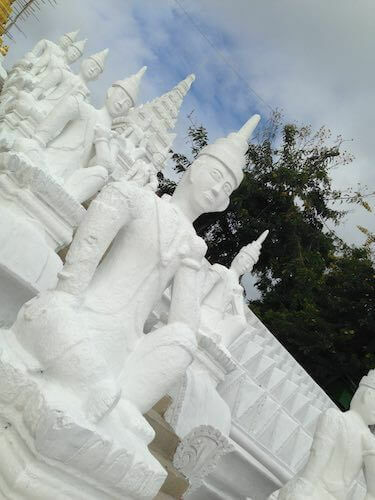 There is enough here to fill a day and have an interesting time seeing a pretty part of Myanmar. The main drawcard to visit Mingun Village, just down the river from Mandalay, is the giant Mingun Temple/unfinished pagoda. Not only is it impressively huge in both height and width but the earthquake cracks running down it’s side make it even more special. There is a small unassuming shrine you can visit at the front of the temple, but the better view is from the very top. Despite signs saying not to climb the structure, there was a huge line of people (mostly locals as it was a national holiday) climbing up the steep steps to the top, so we followed the crowd. Be careful climbing up there! It’s a steep climb and there are many deep cracks to fall down and no safety fences to stop you falling off. But the view of the village and snaking Ayerwaddy river from the top plus the monks taking selfies up there is worth it. There is a small unassuming shrine you can visit at the front of the temple, but the better view is from the very top. Despite signs saying not to climb the structure, there was a huge line of people (mostly locals as it was a national holiday) climbing up the steep steps to the top, so we followed the crowd. Be careful climbing up there! It’s a steep climb and there are many deep cracks to fall down and no safety fences to stop you falling off. But the view of the village and snaking Ayerwaddy river from the top plus the monks taking selfies up there is worth it. 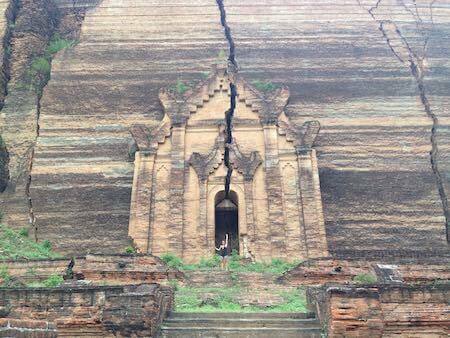 One of the impressive cracks in the huge unfinished pagoda in Mingun. I look so tiny!. There is an interesting back-story to this temple, a superstitious king wanted to build the biggest pagoda in the land in order to enshrine a sacred Buddha tooth relic. The pagoda was going to be 152 meters high, also a symbol to show off his power and wealth. 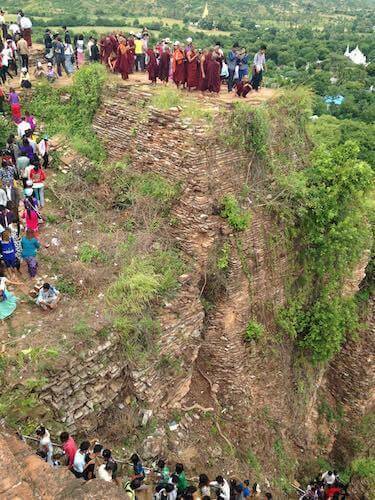 After 7 years of work on the Mingun Pagoda, when it was standing at only 50meters tall, work stopped. Legend has it that the King had been told by a well known astronomer that once the Pagoda was finished the King would die and the Kingdom would collapse. So he stopped, and the project was never continued. The Kingdon collapsed anyway. 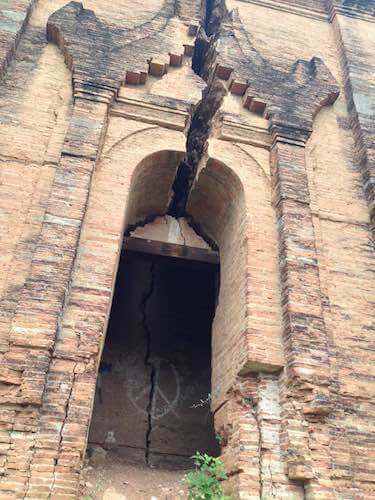 2 big earthquakes didn’t manage to down the unfinished Mingun pagoda, but did leave huge cracks down the 5om structure making it look like it could fall at any time. Amazing to see! The village is small and very easy to walk around. They are set up for tourists, with a foreigner fee station (that we somehow managed to avoid due to the business of that day) and a little market selling the usual tourist rubbish. Apart from the main attraction of the Mingun Pagoda there is also a random display of left-over army vehicles, another beautifully ornate white pagoda and of course the Mingun Bell. 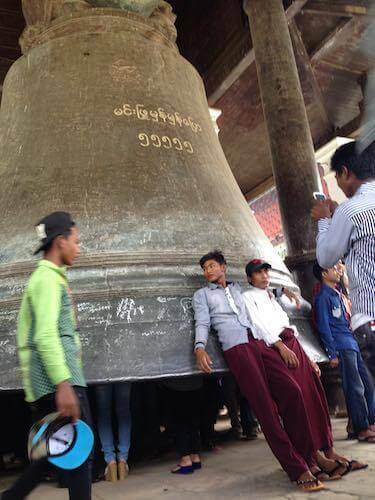 We were there on a national holiday and the bell was very very popular, there were people hanging out inside the bell as well as people hitting it with a wooden bar to chime it. 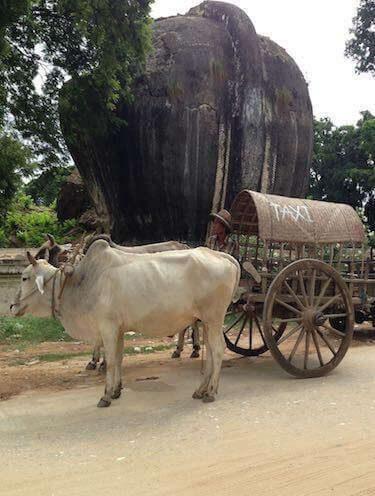 It is a drive or short boat ride from Mandalay. The drive seems more fun, but the boat is cheaper. The ferry boat to Mingun from Mandalay cost us 5000kyat return. You buy the tickets down at the dock. I chose the boat option as, after taken the minibus from Bagan to Mandalay instead of the long boat, I wanted the chance to go along the Ayerwaddy. In my head was the dreamy Kipling stories of floating down this river and I wanted to be in that fairytale. The reality is quite different. It was very very noisy, with the sound of the motors and honking horns from all the boats drowning out any possibility of conversation. It was also very windy and cold that day. There is not much to see as you float down the river as it is very wide so you won’t see villages at the side etc, just plenty of muddy river water and hundreds of boats. Sitting there scrunched up on an uncomfortable chair in the rain on the way back, with the motor in my ears, I was glad we hadn’t taken the full day boat ride from Bagan to Mandalay in the end.